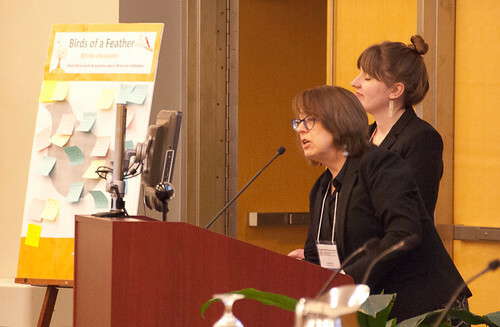 In keeping with “Open principles” of participation and community-building, this year’s symposium featured a “Birds of a Feather” session. This BOF approach asked symposium participants to suggest discussion topics throughout the day; after the keynote speech and panel presentations, the final topics were voted on, and subsequently topics were assigned a table (or two), where interested participants could join in discussions with folks who have the same interests. At the end of the small-group discussions, representatives from each table reported back some of the key-points. The following attempts to capture the highlights of each topic recap. OA at Small Institutions: Group participants noted that the benefit of being “small” is that Outreach is easier, but the flip-side is that there is also no possibility of having a “dedicated” metadata or Scholarly Communications librarian. They pointed that confusion regarding copyright law can serve as an obstacle to adoption of OA at small institutions. When looking for grants, they noted that some are specifically geared towards small institutions: e.g. METRO Grants. In terms of OA software and systems, some group members mentioned that they were successfully using Moodle for capstone projects, Collective Access (collectiveAccess.org) for managing and publishing museum and archival collections. Open Education Resources (OER): This group chatted about the emerging role of both finding and creating OA textbooks, this was especially helpful for providing books for remote campuses or study abroad. They laid emphasis on “Library Marketing” to promote the value of OERs, both in terms of savings for students and in terms broad access to scholarly works. Publishing 101 for Faculty: Those participating in this group expressed their gratitude for SPARC (sparc.arl.org) for providing so many concrete resources in “making the case” for OA among students, graduate students, admin, and faculty. The group members recommended “infiltrating” campus workshops and departmental meetings for both informal and formal opportunities to promote OA. OA and Information Literacy: This group looked at OA from both the instructor and student point-of-view. From the Instruction POV: The group suggested introducing OA into scaffolding, and perhaps including a viewing/discussion on “Internet’s Own Boy: The Story of Aaron Swartz” as a part of such an introduction. Other suggestions for instruction included bringing-in or interviewing faculty/researchers who use OA, and incorporating OA into online courses as a module and including resources, perhaps using Libguides as organizing platform for OA resources, including research from NGOs and IGOs. From the Students POV: The group suggested focusing on discussions regarding “paywall” and access beyond graduation. It was noted that students are already used to file-sharing, and using an analogy might make the idea of sharing scholarly works more understandable/urgent for them. OA File-sharing might also be a good segue for talking about copyright and Creative Commons. It was noted that it might be helpful to have more than one session to cover and reinforce. Institutional Repository Challenges, Nuts & Bolts: Group members stressed some tasks which ought to be undertaken prior to “start up”, including gauging participant interest in actually submitting to an IR, coming up with collection development policy for IR, and investigating/implementing metadata standards to facilitate federated search within and among institutions. They also suggested including community in all decision-making along the way. Collaborations/Partnerships: (group also boasted a diverse array of librarians). Remember that collaboration is not just with external parties, but internal parties as well. Think of other department and colleagues you can partner with. You may need to look for faculty who might not enjoy “Administration/Dean” support initially: look for lone-wolves to work with for initial promotion. Noted that working with special collections/archives is a “built-in” collaborator. OA and Community Colleges: What are the benefits? This group emphasized the relationship between Open Education Resources and information-literacy / life-long-learning. They also discussed the benefits and disadvantages of relying on Google Scholar/wikipedia for life-long learning, asking students to think critically about what is there/what is missing. Increasingly Community College students are being encouraged to see themselves as content creators, so they might consider whether they want their own work to be “Open”. Reference Services: The main discussion centered on the benefits/disadvantages of adding OA Database/resources to the A-Z list. The Symposium Committee is grateful to our participant-colleagues for their willingness to share their time and thoughts with us in this session.